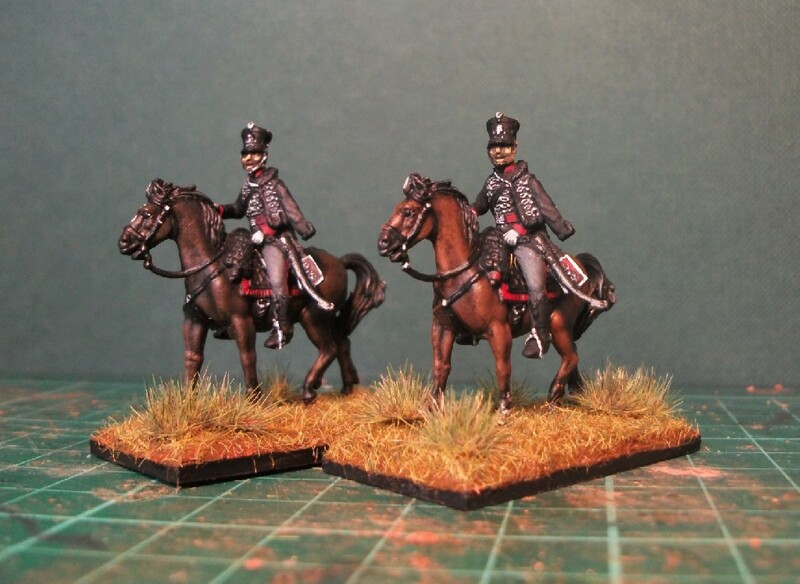 For a light cavalry regiment, it’s been very heavy going getting these figures to completion. More lead than ‘légers’, one might say! Attempting 16 figures rather than my more usual 10 has made for slower progress. There’s lots of detail in the sculpting. Consider also the addition of attaching the separate lances with arms, and you may appreciate how the task takes longer than usual. The set looks so good however that, although my momentum flagged once or twice, it was never an onerous paint job. Waterloo 1815 make some beautifully sculpted figures, both men and horses included, some questionable horse poses aside. I was hoping to maybe produce at least one more regiment before Christmas but, having taken a while with these lancers, it looks unlikely I’ll complete one before the end of the year. 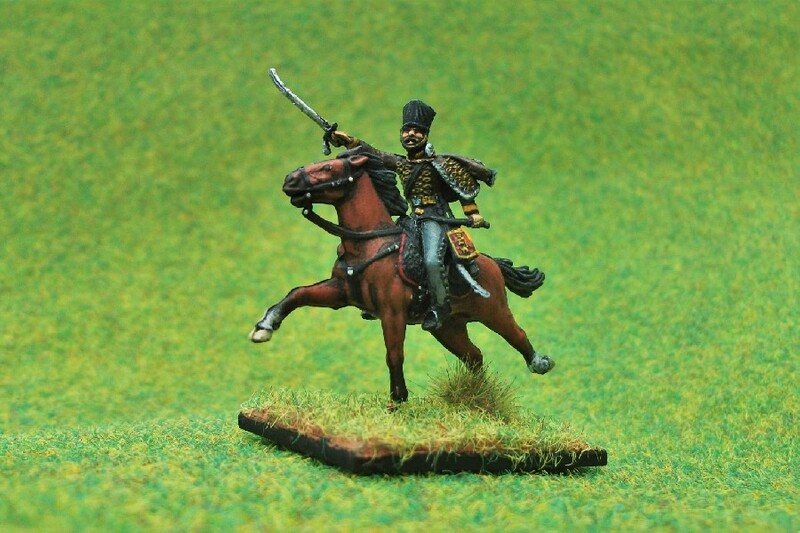 Nonetheless, I can announce that the next regiment in the Nappy Cavalry Project will be… Russian Cuirassiers by Zvezda! Napoleon’s decree of 1811 created nine regiments of lancers. 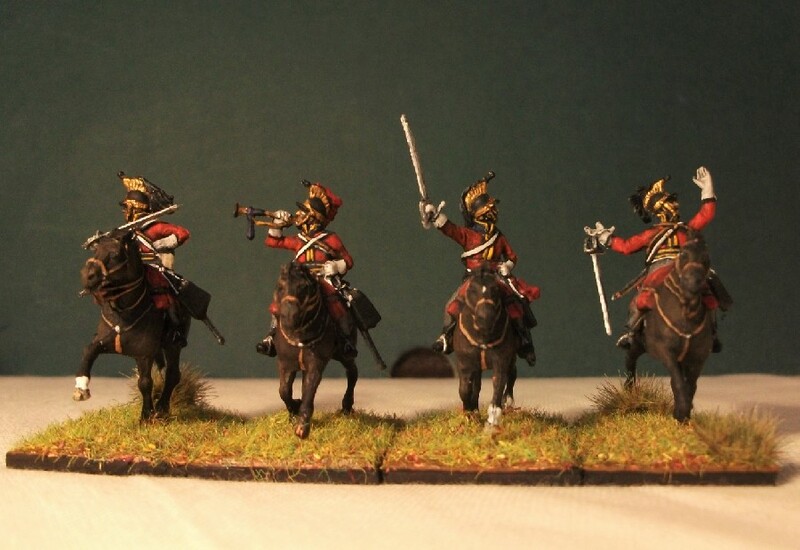 The easiest way to achieve this quickly was to convert one of the many existing regiments of dragoons. Consequently, the 1st Regiment of Dragoons duly became the 1st Regiment of Lancers (Cheveau Legers Lanciers). The 1st Lancers soon participated in the 1812 invasion of Russia, initially covering the crossing of the Elbe before joining the 1st body of Reserve Cavalry of the Grande Armée. The first squadron took part in the battles of Smolensk and La Moskowa, where the squadron leader Dumanoir led charges. Following the disastrous retreat from Moscow, the regiment reformed from conscription and the remnants left at the depot, immediately taking part in the Leipzig campaign of 1813. As part of the 1st cavalry corps of the Grande Armée, it fought in the battles of Dresden, Leipzig and Hanau. During the following campaign in 1814, the regiment was part of 1st cavalry corps’ defence operations during the retreat to Paris. The 1st Lancers distinguished themselves during the battles of Vauchamps, Reims and Paris. After Napoleon’s exile, the Bourbon regime renamed them (partly reformed with elements of the 9th) to become known as the Régiment des Lanciers du Roi (n°1) and retained this royal title up until the inception of the Hundred Days Campaign in April 1815, when the reference to the king was duly dropped once more. During this their final campaign, they formed part of Baron Subervie’s 5th Cavalry Division, partnering the 2nd Lancers in the Colbert’s 1st Brigade. Deployed inconclusively on the French left during the victory at Ligny, it proceeded to follow up Wellington’s retreat to Waterloo, even attempting an unsuccessful charge during a thunderstorm. On the 18th June 1815, Colonel Jacquinot led his 415 men of the regiment on the extreme right flank. It saw little of the serious fighting experienced by the 5th and 6th Lancers in countering the Allied Heavy Cavalry charge. Instead, the 1st Lancers did assist in confronting the Prussians as they emerged out of the Bois de Paris to threaten Plancenoit, attempting to check the irresistible advance of Bulow’s Corps. After Waterloo, the 1st lancers were disbanded on Christmas Day 1815. The majority of men and horses were incorporated in the new 8th regiment of Chasseurs à Cheval de la Côte-d’Or. Lancers did not completely disappear from the French army, however, the reorganisation of 1815 stipulated that the last squadron of each regiment of cavalry be armed with lances. Notable Battles: La Moscova, Dresden, Leipzig, Vauchamps, Ligny, Waterloo. I’ve been painting lots of horses recently, a veritable herd of them in fact. 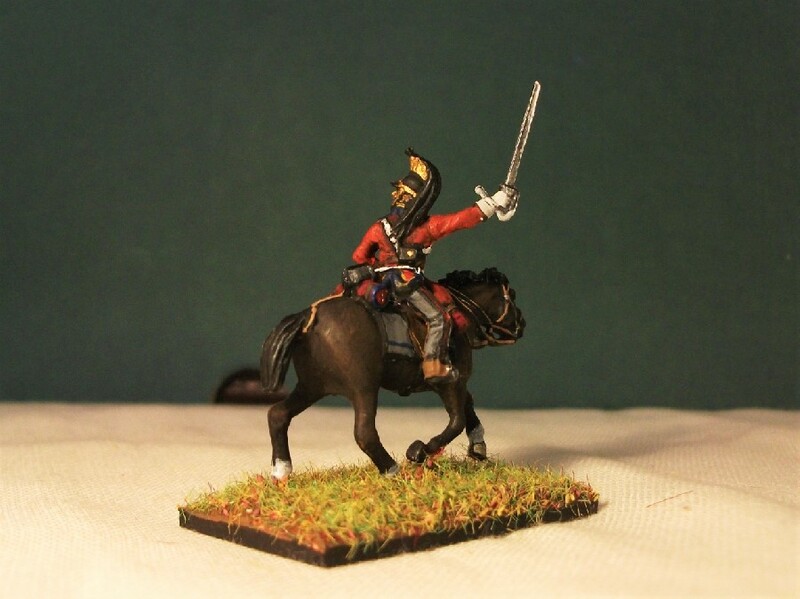 I admit that it has been slow progress on the French Line Lancers set. I think painting up to 17 horses in one go is one factor in this slowness, but the herd is nearly finished. I’m reasonably happy with their progress but I can’t help but feel that I do better work in the summertime when there’s far more light than in these gloomy, dull November days in Britain. Here’s “the herd” awaiting some final attention before their riders get attached. And below is more or less what the finished figures will look like once I’ve concluded with those last bits of paint and glueing. These riders don’t fit on easily I note – (do they ever?) – and I’m expecting a bit of struggle to get them mounted! It’s been a long time coming, but I can finally see the light at the end of the tunnel with these lancers. Hopefully, they’ll be finished and photographed before the end of this week. I admit it. There really hasn’t been much progress over the past couple of weeks with my lancers. Partly this has been due to the impact of domestic issues. My father suffered a minor stroke and, although it was thankfully minor and he’s recovering well, I seem to have lost my mojo somewhat since then. Bigger issues like family health seem to place more trivial things such as modelling soldiers into perspective. I have, nonetheless, been able to basecoat most of the horses and paint / glue the lances. So, here’s a very quick view of some of those lancers with lances. I should point out that they do still need a little work. There’s a flag bearer that’s still awaiting work on his flag. Hopefully, I’ll be able to find some time and get into gear soon. In the meantime, I’m being careful with those lances, they are all so delicate that I’ll be surprised if I don’t break some before completion! Flag bearer for the 1er Regiment de Cheveau-Legers Lanciers – sans flag! 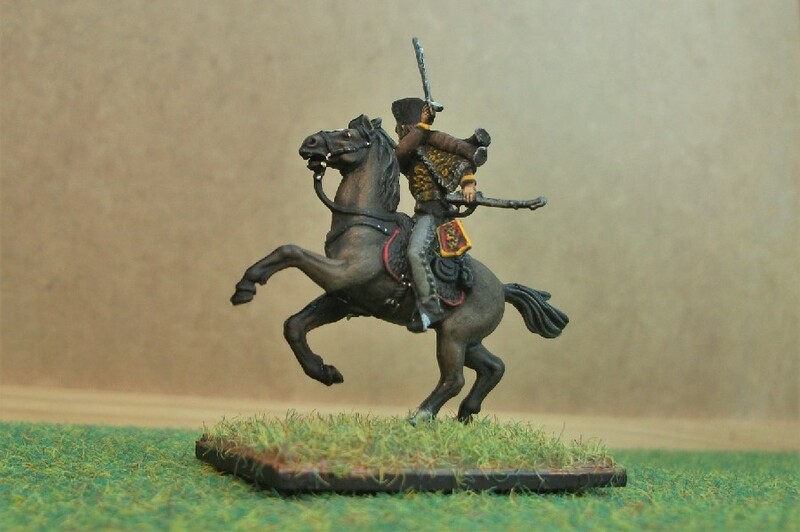 In my last post on the latest regiment in my Nappy Cavalry Project, I suggested that the 4th Lancers were to be my choice for Waterloo 1815’s French Line Lancer set. However, I (mis)spent a sizeable portion of a morning off from work experimenting with mixed paints to reproduce the exact shade I required for the 4th. The conclusion of my experiments were never quite satisfying and so, rather than condemning myself to being unhappy with an incorrect colour, I elected to simply change my mind and pick another regiment. 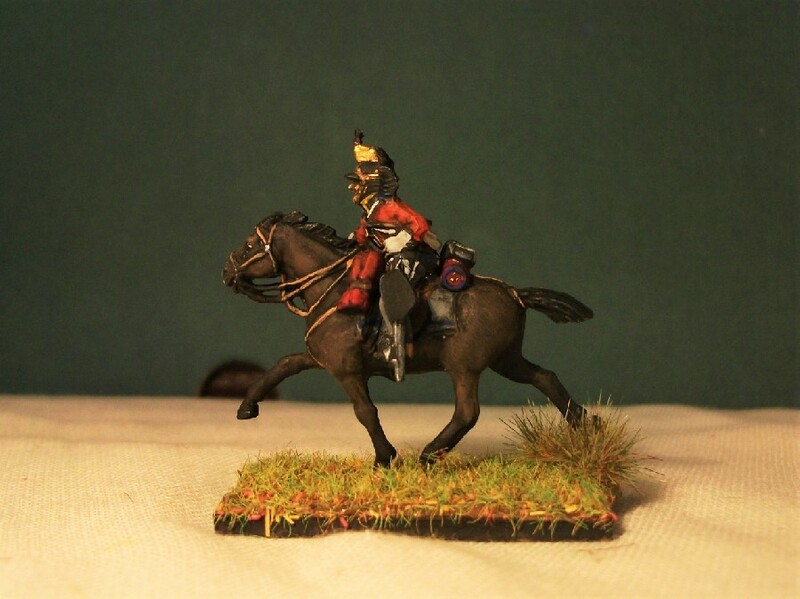 Instead, I am tackling the 1st Regiment of lancers who wore red facings. The contrast between green and red is a pleasing one, and it means being able to simply choose one of my numerous red shades of Vallejo paint rather than mixing one up. With 17 figures to tackle, this regiment has the feeling of being a project all of itself and will certainly take some time to finish. It’s a hobby, not a production line, so I’m happy to take all the time necessary. That said; they’re coming along nicely and already I’m approaching tackling the horses which I envisage will take a little longer to create. Did I say I’m nearly on to painting the horses? I was forgetting a number of arms and lances which are still attached to the sprue and awaiting paint. I’ve left these until now because the plastic of this set is particularly brittle and liable to snap. Leaving them until later reduces the risk of accidents! I think adding the lances will make a huge difference and I’m looking forward to seeing them finally painted and attached (this will probably be the focus of my next update). After all they’re not much of a lancer regiment without lances! 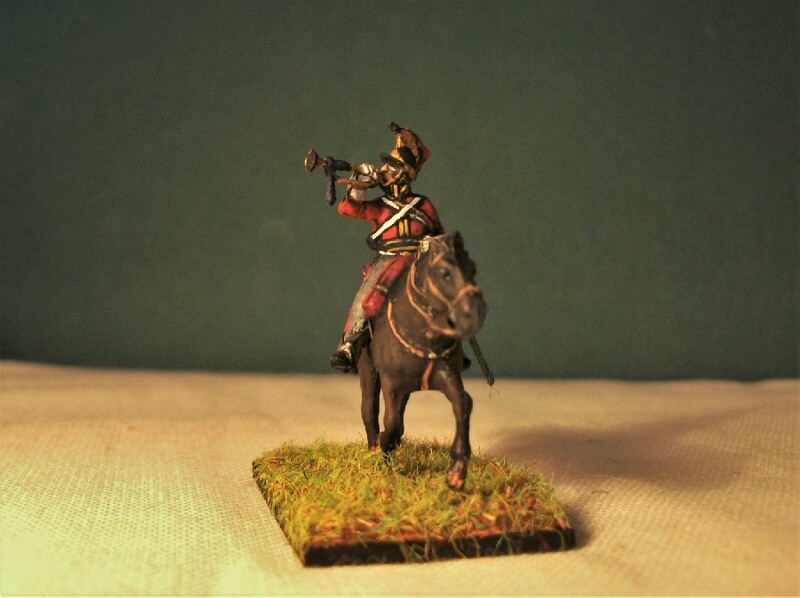 French Napoleonic Lancer by Waterloo 1815 awaiting some attention with my brushes. 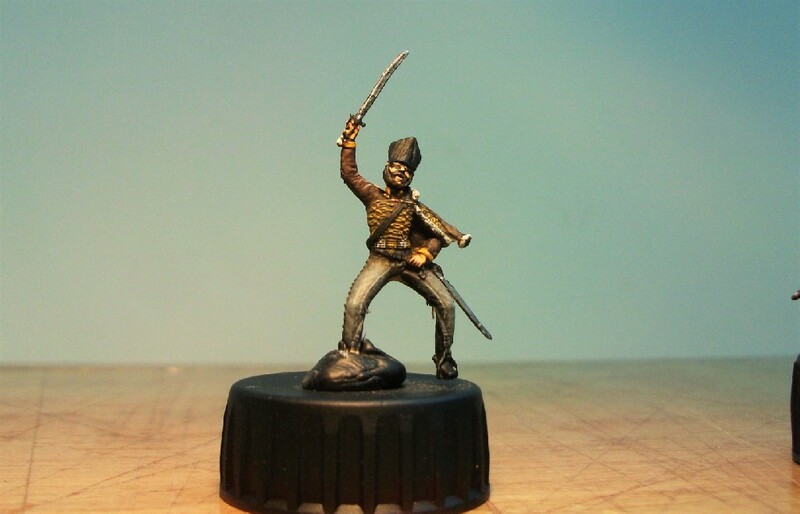 With the French Horse Grenadiers now despatched, it’s straight on to my 20th regiment in the Nappy Cavalry Project. I’m staying with Napoleon’s cavalry, but instead of a Heavy regiment of the Guard, I’m tackling a Light regiment of the Line; specifically I’m painting French Line Lancers 1811-15! 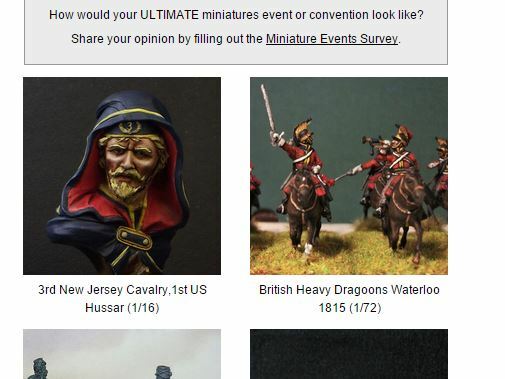 The figures are by Waterloo 1815 and were released last year, just a little too late to be included in 2015’s figures. I’m a big fan of Waterloo 1815. They’re not always completely historically accurate but this set (horse sheepskin shapes aside) is excellent. 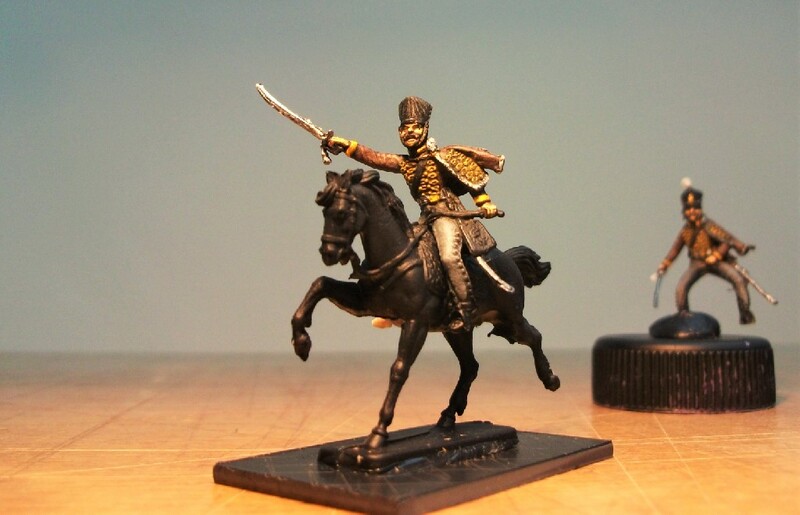 The sculpting on this French Line Lancers set is, as always, superb and wonderfully crisp. 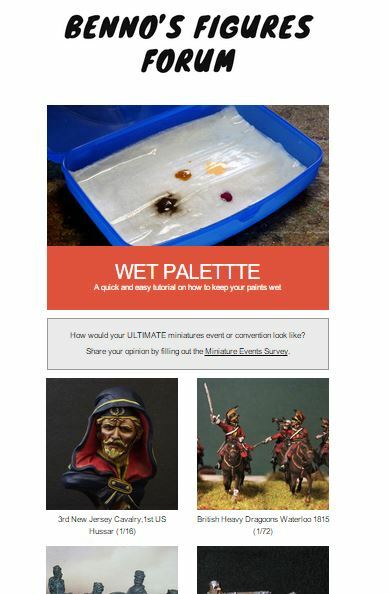 All of which makes for a rewarding painting experience for the modeller. 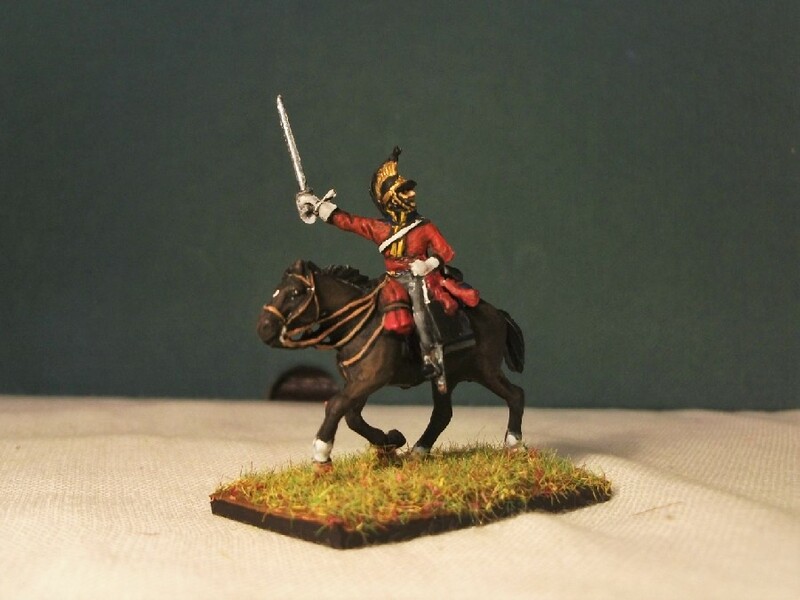 I’ve chosen the 4th Regiment of lancers, known as 4ème Régiment de Chevaux-Légers Lanciers, purely because they sport burgundy-like coloured facings which I thought would make a nice change. Sunny day outside. Maybe I should stop playing with soldiers and get out in the fresh air?! 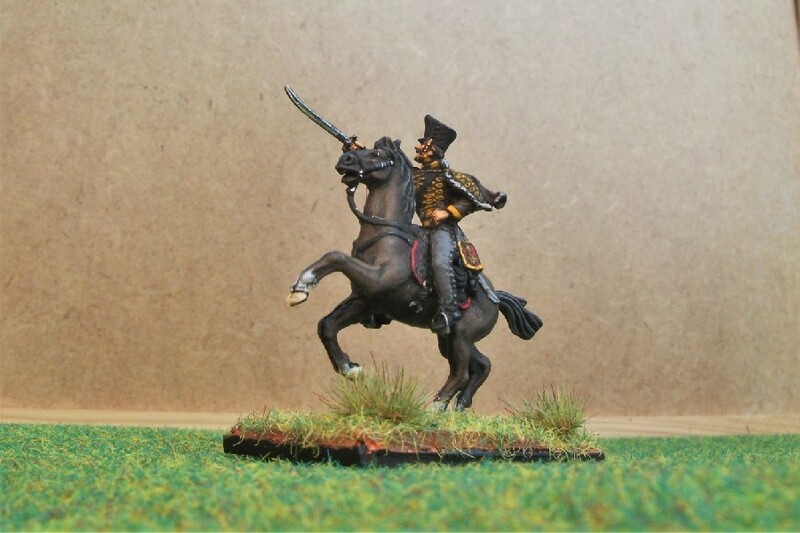 Only the Red Lancers and Guard Cossacks have sported lances in the project so far, and after painting plenty of dragoons and hussars, it’s great to be having a go at some more lancers. There’s a lot of them too. Waterloo 1815 pack a whopping 18 riders into a box. That’s a lot of figures to paint for someone who was tackling just 10 at a time for the previous regiments, but nevertheless I’m going to attempt the lot! “The Death of General Ponsonby” at the hands of French Lancers, (apparently the 4th Regt – coincidentally my chosen topic). The only real moan on Plastic Soldier Review is that the horse furniture is wrong, the sheepskin being wrongly sculpted into a kind of shabraque. They recommend switching to horses from another set, but I’m tempted to stick with them, the sculpting of the horses heads in particular being so impressive. 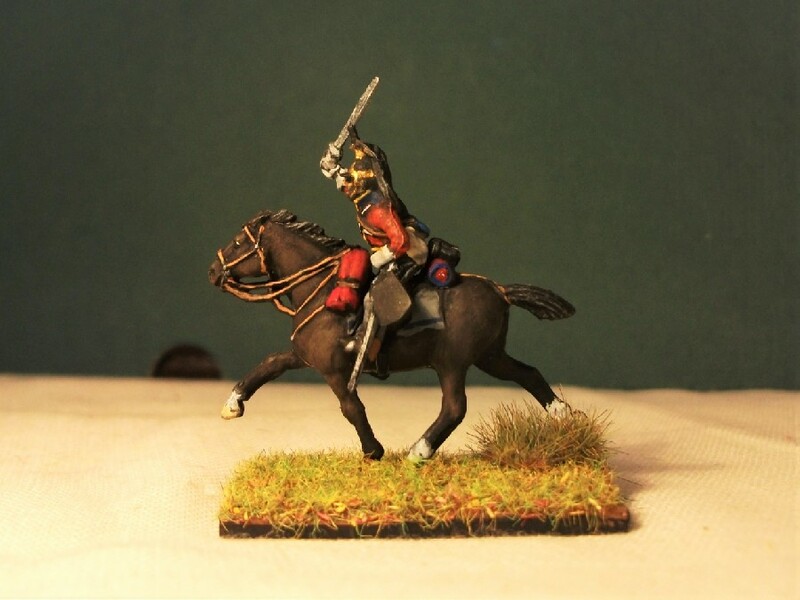 Horse from the Waterloo 1815 French Line Lancers set. Watch out for progress reports. Nappy Cavalry Project: The Grand Parade! Here’s the end of year Grand Parade of the Nappy Cavalry Project I promised. Just a bit of eccentric silliness on the dining room table! 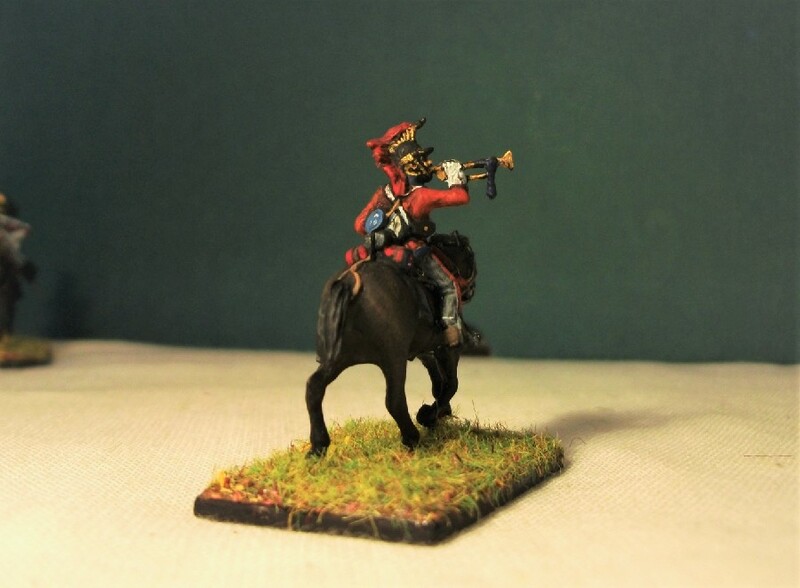 I’ve added a soundtrack of genuine Napoleonic-era military tunes, both French and British tunes. I’ve uploaded the 6-minute video to YouTube and embedded it below for your “entertainment”. And I’ve still got the traditional Christmas infantry to finish off, my new Yule Grenadiers. My aim is to finish them off and have them paraded on the mantelpiece before the Christingle service on Christmas Eve. In the meantime, I can sign off this project with a sense of satisfaction that comes from seeing it through to the end. 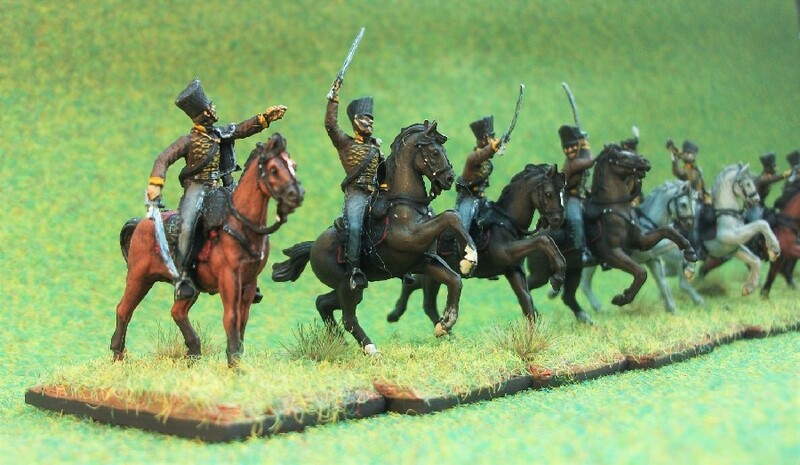 I’ll say it again; I really do like the sculpting on these Waterloo 1815 Prussian Hussar sets. 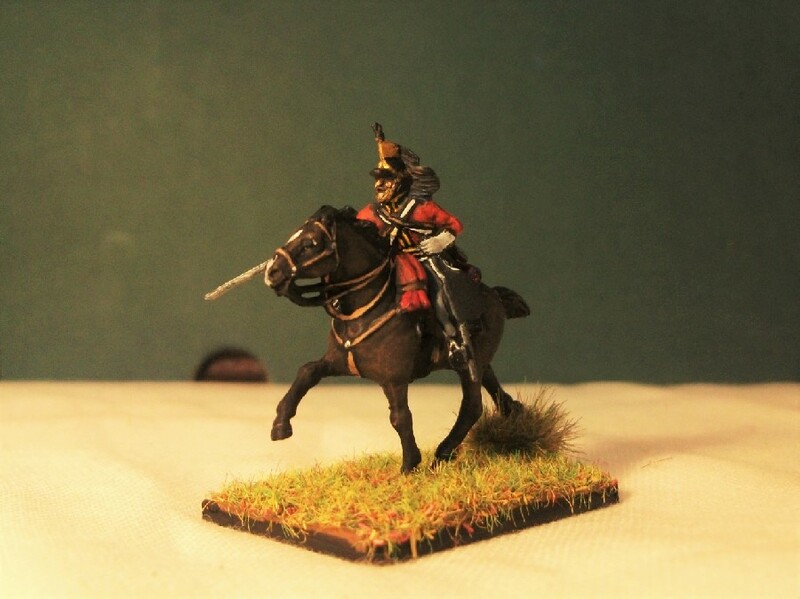 I’m also glad that I chose the 4th regiment as a subject, because it’s been interesting to produce brown-uniformed Napoleonic cavalry. 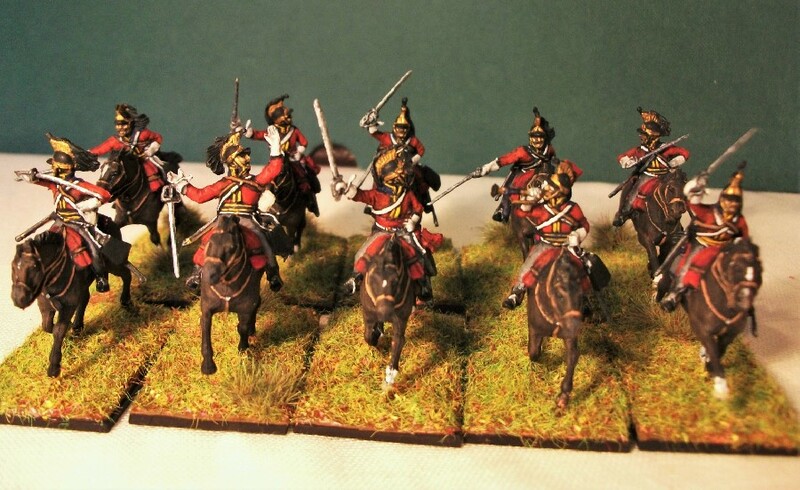 I was a bit lazy though and really didn’t deal with all the flash on the horses before I started painting but, that aside, I’m still pleased with how the regiment has turned out. Without any further waffle, here’s the finished figures for my ninth regiment in the project, together with the usual regimental biography. The 1st Silesian Hussar regiment was formed on 15th November 1741 at the instruction of Prussian King Frederick II. It was originally designated the 6th regiment of Hussars and named after the commanders of the regiment, though apparently known colloquially as the ‘Brown Hussars’. These hussars saw action in the 2nd Silesian War, the 7 Years War, the Bavarian War of Succession and the French Revolutionary Wars. Serving in the 1806 and 1807 campaigns against the French, the regiment was present at the battle of Heilsberg, prior to the decisive battle of Friedland itself. Following the Peace of Tilsit in 1807, the Silesian Hussars were then subject to the same extensive reconstruction being then applied to the whole Prussian army. 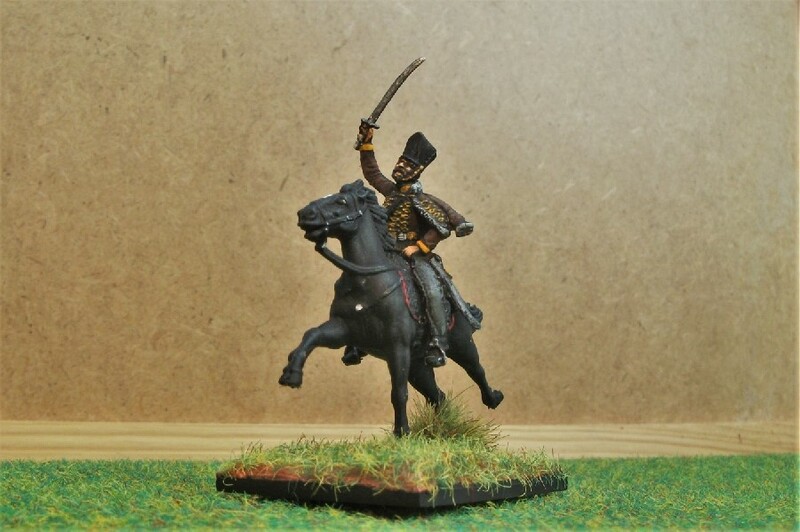 In 1808, they were known as the Lower Silesian Hussars and then later in the year as the 1st Silesian Hussars, being now officially numbered as the 4th Hussar Regiment. It was then compelled, along with the rest of the Prussian army, to take part in Napoleon’s 1812 invasion of Russia (their allies in the previous conflict). They were present at the battle of Schlock, being on the receiving end of British gunboats who’d penetrated upriver to assist the Russians. They then fought in the minor engagement of Wolgund in Latvia resulting in a Prussian victory, and also at the later reverse at Dahlenkirchen. In the Leipzig campaign, and now opposing Napoleon once again, the regiment saw action at Königswartha, Dresden, the siege of Wittenberg, and elsewhere, before taking part in the decisive battle of Leipzig itself. On their way to capture Paris in 1814, they featured at the battle of La Fere Champenoise, where mass cavalry charges broke infantry squares and captured part of the Young Guard. 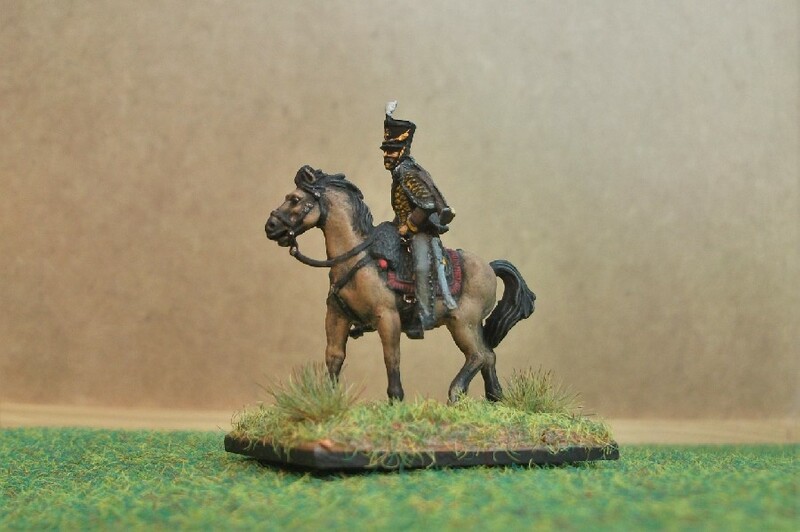 By 1815, in the Hundred Days campaign they were under the leadership of Major Von Englehardt and had an attachment of around 30 mounted jagers. The 4th Hussars fought at the desperate battle of Ligny as part of 1st Cavalry Brigade of Von Ziethen’s 1st Corps. This brigade suffered particularly badly from being exposed to artillery fire, losing nearly a third of their number by the time of their rather late arrival at Waterloo (around 7:30pm). Numbering barely 270 men across it’s three squadrons, it was perhaps well that the 4th Hussars were actually required to contribute very little to the final victory that fateful day. Heilsberg, Schlock. Wolgund, Dahlenkirchen, Königswartha, Leipzig, La Fere Champenoise, Paris, Ligny, Waterloo. A guiding principle behind this year’s Nappy Cavalry Project has been the notion of variety. Different types of cavalry sporting different colour uniforms is the theme. 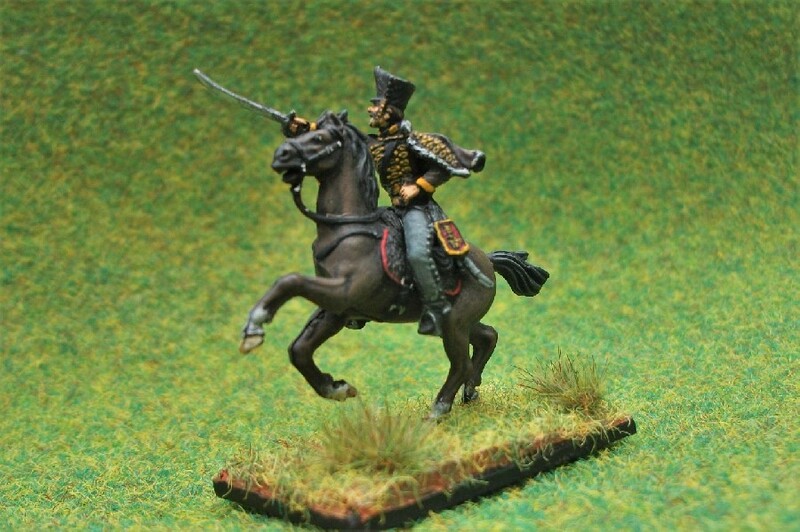 Thankfully, there’s few more colourful eras for the military modeller than the Napoleonic. 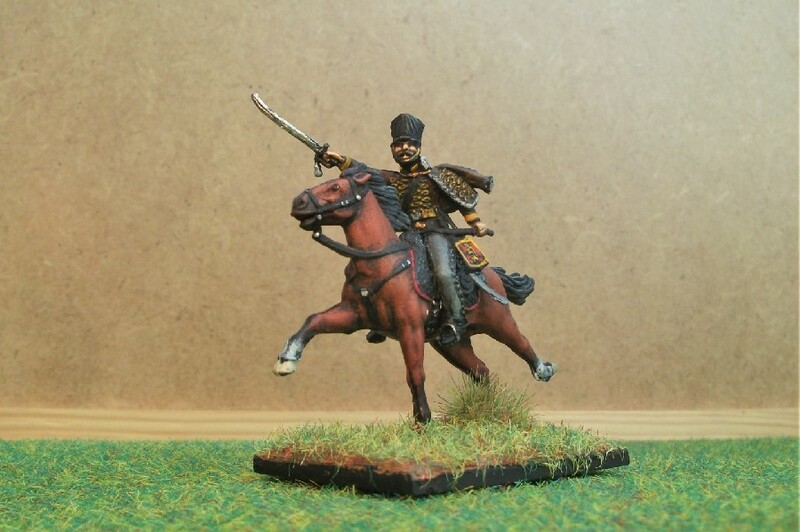 In deciding which next regiment to paint, I was eager to get back to some more flamboyant-looking hussars after all those dragoons. 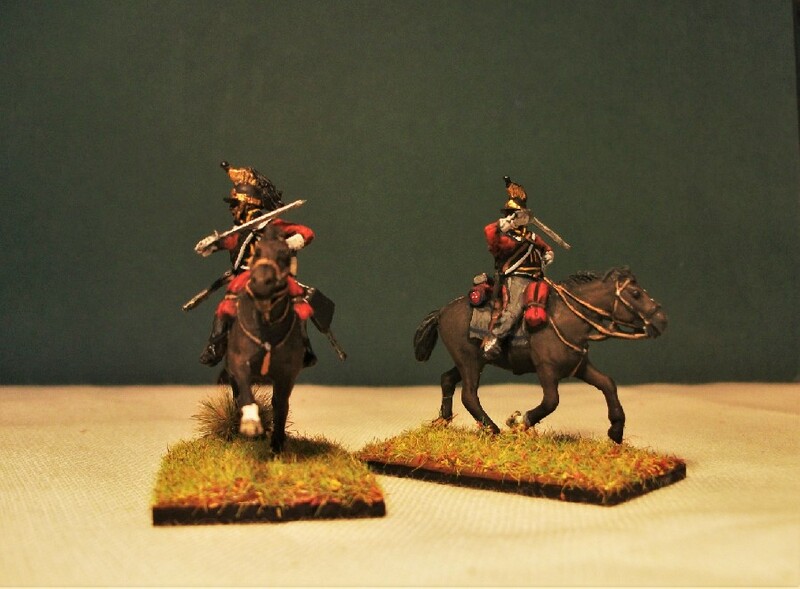 These Prussian Hussars by the Italian manufacturer Waterloo 1815 were purchased earlier in the year along with two other hussar sets. 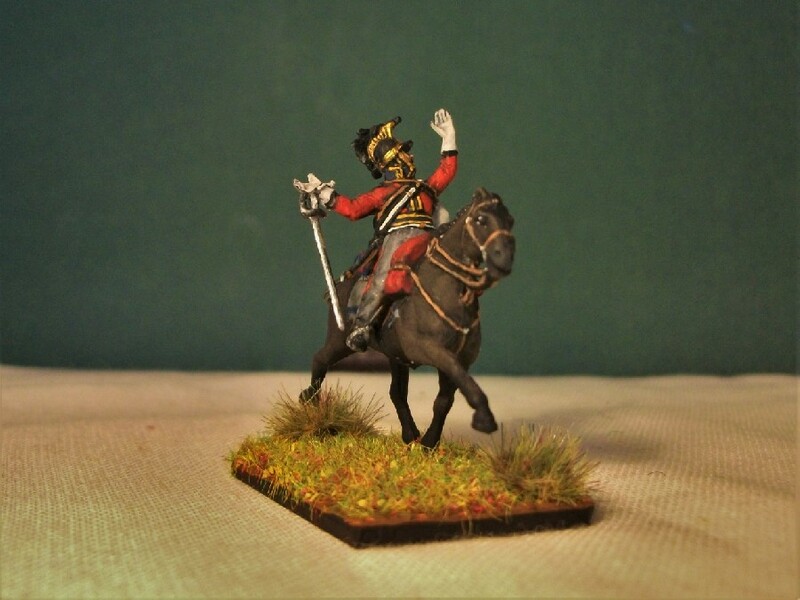 The first Waterloo 1815 hussar set that I painted back in May was the Leib “Death’s Head” Hussars, a regiment dressed in intimidating black dolmans with white braid and a skull and crossbones on their shakos. Waterloo 1815s’ other Prussian Hussar set presented me with a number of possible Prussian regiments to depict, all of them wearing shades of either black, blue or green. 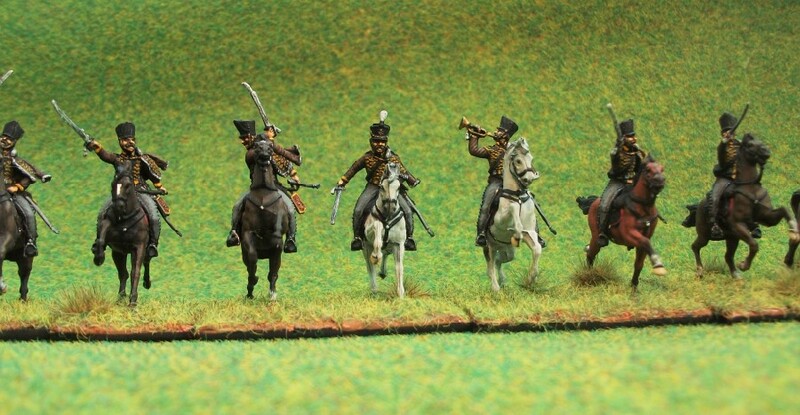 But there was one exception; the Erstes Schlesisches Hussaren-Regiment (or 1st Silesian Hussar Regiment), which unusually adopted a brown dolman and pelisse. I couldn’t resist the opportunity of attempting a Nappy cavalry regiment wearing a brown uniform, so my choice was made. 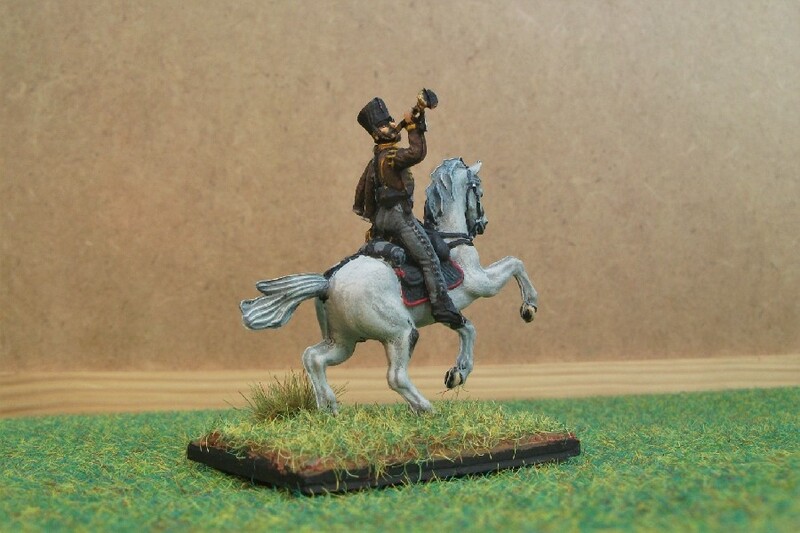 Regiment number 9 will be the 1st Silesian Hussars! 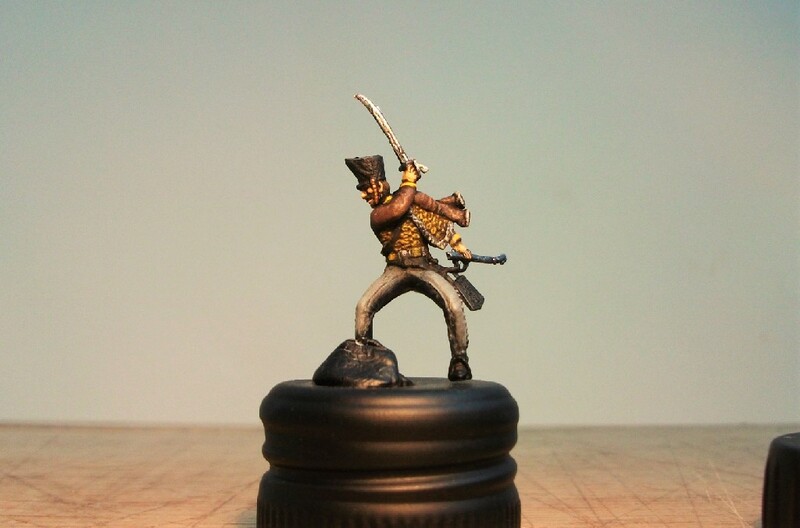 I found myself fretting about getting the right shade of brown; I’m just not used to painting brown uniforms! Nothing I had in my paint collection seemed quite right and buying a new colour is always a risk, so I eventually elected to mix my own shade from the browns in my collection which I think looks similar to what I intended. The 1st Silesians had a yellow braid on their brown uniforms and this set, unlike the Leib Hussars version, depicts the shakos covered in oilskins (with the exception of the officers). I’ve set to work on the uniform using various combinations of brown and this is the result so far with other details applied but still needing a little more work. Hussar of the 1st Silesian Regiment. Work still to be done but they’ve certainly come along way over the weekend. After the figures, then I’ll be turning my attention to their horses.